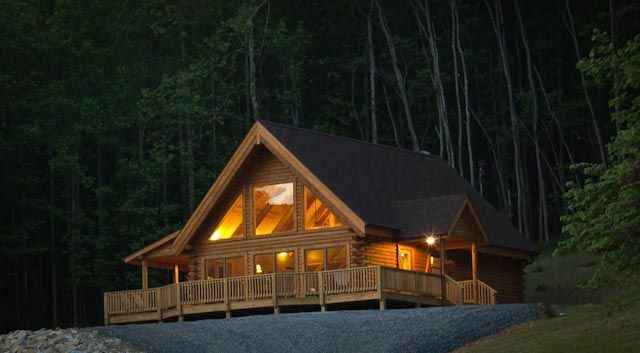 Meadow View Cabin, a new deluxe log home near Lexington VA.
2 Bedroom, 2 full baths, no pets, no smoking! Meadow view offers a master bedroom and bath on the first floor. The home can accommodate 4 people. However, there is an additional fee added for over 2 guests of $75.00 per night. The attached baths provide oversized showers and room to move around. The kitchen on the main floor is fully equiped to prepare almost anything. The great room has a dramatic window wall with a panoramic view os a quiet country lane with hills and trees. The drive to the town of Lexington is an easy 12 minutes. Meadow view was built in 2012 and has everything you need for a weekend or extended stay. Jeff and Marianne live full time in Lexington. Jeffrey graduated from Washing and Lee University in 1971. Marianne is an artist and photographer. We really enjoy the college town of Lexington and the mountains and the surrounding area. Meadow View Cabin was built (2012) as an upscale log home. The beautiful granite counter tops, hand made red oak and fir stairs, 6' toung & grove pine board ceiling with large exposed fir beams, and ultra fine bedding make this cabin stand out from the rest. A fully equipped kitchen, beautiful wraparound deck and covered porches, are nice amenities for the cabin. Close to historic Lexington, this cabin is in a great location for history buffs, vacationers, or parents of the collage students. Beautiful meadow views, on a scenic Country Road. Great cabin, very clean and decorated beautifully! Very close to VMI (about 10 minutes). We enjoyed our stay so much! We enjoy keeping Meadowview clean and nicely decorated for our guests. Not overly huge like a lot of these other places that are massive, Meadowview is an A-Frame cabin that has a nice, normal sized bedroom and an upstairs loft that has two twins for kids. The view is of a small hill that a bunch of black cows graze on, and it's normally very quiet save a jet once in a blue moon. There's little light pollution so star gazing is nice there. The place is perfectly setup for a couple, and is very clean and put together well. The owners are very wonderful people and I highly recommend their cabin. If anything goes wrong, they'll take care of it. I've stayed there at least 6 times and it's a favorite of mine. If you work remotely, know that the Internet is DSL and is probably 128K, meaning it's very slow. The Wifi needs some help as it's as slow as the Internet if not slower. It works for the most basic of tasks, but it struggles with streaming. Also, there is no cell reception at the cabin (AT&T or Verizon, I don't know about Sprint or other providers). That's a real nitpick for such a great little cabin. Most vacations aren't about the Internet (Unless you got kids that are stuck to their devices -- teenagers, etc.). The only reason I bring it up is you may need it for your trip -- if so, don't count on blazing fast Internet. The couches are super comfy, the bed is too. It's also decorated very nicely and is charming. I wouldn't have stayed 6+ times if it wasn't. I highly recommend Meadowview Cabin and the Salbs. My family and I enjoyed our stay very much, and would recommend it again. The house was beautiful and the location was super peaceful amd calm. We had a wonderful stay over Thanksgiving at this beautiful cabin. All of the amenities that we needed we available and waiting. The house was everything I hoped for and more. Our family enjoyed the time together without all of the distractions of every day life. The location was perfect with a 10 min drive into Lexington. We would definitely stay here again if we were in the area. Meadowview Cabin overlooks meadows where cows graze. The cabin is located in Lexington about 17 minutes from VMI’s campus. It is a cozy place to relax & unwind as you spend time with loved ones. This place is by far our preferred choice of places to stay in Lexington. Your stay has many of the conveniences of home to include a well stocked kitchen. You won’t be disappointed. Lexington is host to two colleges, Washington & Lee and VMI (Virginia Military Institute). Along with all the Civil War history, Lexington’s strolling streets are the regional center for restaurants, museums, cultural activities, shopping and really cool art venues……. it’s much more than you’d expect. The use of the 2nd bedroom/bathroom (Loft) is $72 per night (1 or 2 people).